Cytokine signaling involves a cascade of tyrosine phosphorylation events. Tyrosine phosphorylation of many proteins is rapid but transient. It is therefore not surprising that dephosphorylation of activated signaling molecules by specific phosphatases is an important mechanism for the termination of cytokine signaling . The Src homology domain 2 (SH2)-containing tyrosine phosphatase SHP-1 has been identified as a critical negative regulator of cytokine signaling . SHP-1 is a cytosolic phosphatase that is expressed predominantly in hemopoietic cells, and the importance of SHP-1 is evident in mice harboring a spontaneous mutation in the SHP-1 gene known as motheaten mice. Motheaten mice, which do not express SHP-1, suffer from a range of hemopoietic abnormalities, including hyperproliferation and abnormal activation of macrophages and granulocytes [6,7]. Figure 1 Schematic illustration of mediators and inhibitors of cytokine signaling. (A) Cytokines initiate signaling through binding to multimeric cell surface receptors. 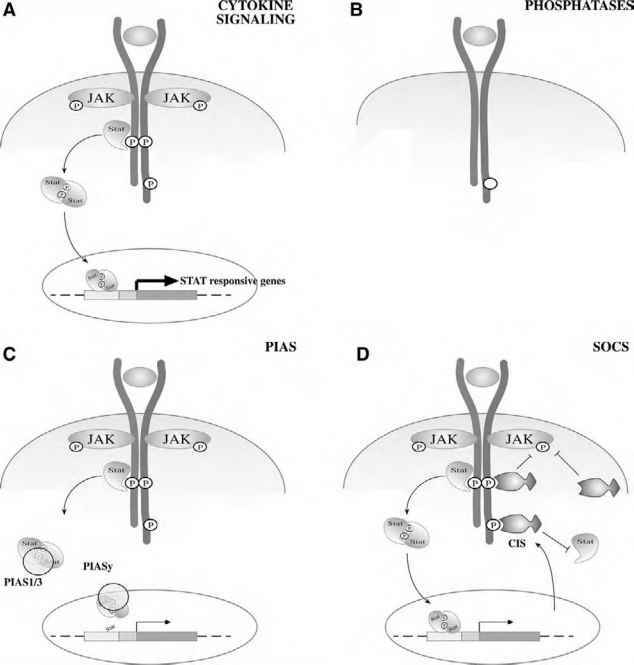 Receptor aggregation leads to juxtaposition of JAKs, which cross phosphorylate each other and phosphorylate tyrosines within the receptor cytoplasmic domain. These phospho-tyrosines provide docking sites for cytoplasmic proteins, such as STATs, which are themselves phosphorylated by JAKs. STATs then dimerize, migrate to the nucleus, and regulate the transcription of genes required for mediating the biological response to the cytokine. 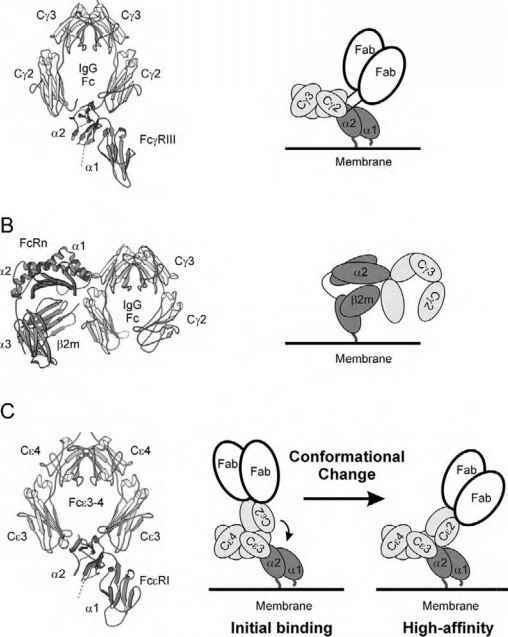 Phosphatases (B), PIAS proteins (C), and SOCS proteins (D) each attenuate signaling by acting at different levels within the cascade. (EPO) , interleukin-3 (IL-3) , IL-4 and IL-13 , interferons [11-13], colony-stimulating factor 1 (CSF-1) , and Steel factor [15,16]. Among these cytokines, the evidence for regulation of EPO signaling by SHP-1 is most compelling. In vitro studies have shown that, upon EPO stimulation, SHP-1 can bind to the activated EPO receptor complex and dephosphorylate the receptor-associated kinase JAK-2. Additionally, cells expressing a mutant EPO receptor that is unable to recruit SHP-1 show prolonged tyrosine phosphorylation of JAK-2 and an enhanced mitogenic response [17,18]. The importance of recruitment of SHP-1 to the phosphorylated receptor cytoplasmic domain in regulation of signaling is highlighted by families in which polycythemia is caused by a mutation that results in truncation of the EPO receptor and an inability to bind SHP-1 [19,20]. CD45 is a transmembrane phosphatase that was initially identified as being an important regulator of antigen receptor signaling in B and T cells [21-25], with its primary targets being the Src family kinases [26,27] . Recent evidence suggests, however, that CD45 is also a JAK phos-phatase and can negatively regulate cytokine signaling [28,29]. CD45 appears to inhibit IL-3-induced proliferation, erythropoietin-induced hematopoiesis, and antiviral responses, both in vitro and in vivo. In vitro studies have shown CD45 can bind and directly dephosphorylate JAKs. Furthermore, IL-3 stimulation of a CD45-deficient, bone-marrow-derived mast cell line induced hyperphosphoryla-tion of JAK-2 and an increased phosphorylation of STAT-3 and STAT-5 .